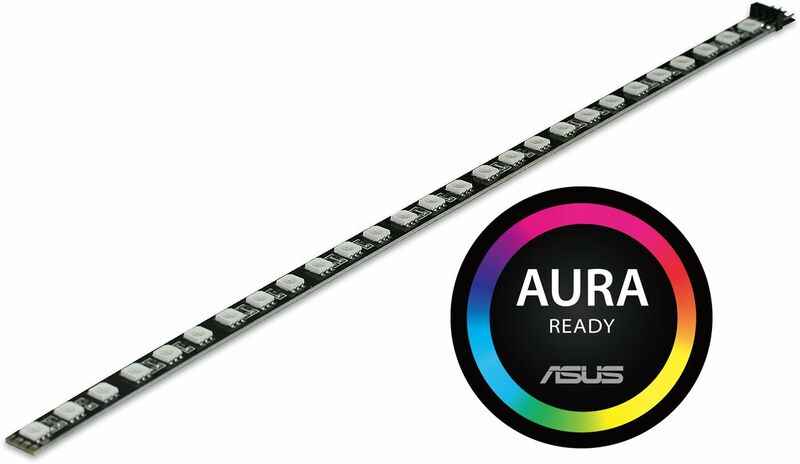 Brighten up your build with the Nanoxia Rigid RGB LED bar that is ASUS AURA Sync certified. The Nanoxia Rigid LED bars offer a particularly stylish and high-quality upgrade for your PC. This LED bar is 30cm in length and consists of 27 ultra-bright RGB LEDs. For the production of the Rigid LED Bars Nanoxia ensured in advance that only components of the highest quality, in accordance with industrial standards, are used. The SMD5050 high-end LEDs used are especially bright and develop an impressive luminosity. The Rigid LED bars come with a 4-Pin RGB-connector connector for motherboards with an internal RGB header - for example the ASUS STRIX motherboards. The ASUS AURA software is perfectly suited for controlling the RGB LED bars and they are ASUS AURA certified. This allows the user to can easily choose their favorite colours, dim the RGB bar or use various lighting modes. PLEASE NOTE: Adding more than one bar to your system increases the power consumption – therefore neither Quiet PC nor Nanoxia are liable for any possible damage to your hardware due to improper use.